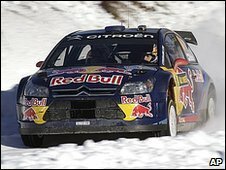 Former Formula 1 world champion Kimi Raikkonen was encouraged by his World Rally Championship debut for Citroen despite finishing 30th in Sweden. The Finn recovered from hitting a snow bank on stage six to finish 37 minutes off winner Mikko Hirvonen. Raikkonen, 30, said: "It was a really encouraging event, which allowed me to learn so much." Ford's Hirvonen was 42.3 seconds ahead of Raikkonen's team-mate Sebastien Loeb while Jari-Matti Latvala was third. Citroen boss Olivier Quesnel was quick to praise Raikkonen's efforts after a difficult weekend. "We cannot ask too much of Kimi at this stage," he said. "Sweden I think is the most difficult rally to start with, and everybody is looking at him and waiting for - I don't know what - but he couldn't give more than he has. "Kimi did not do a bad job here. He told me he made too many mistakes but it's obvious he has to make mistakes - he's learning." Raikkonen set several top 10 stage times, including a sixth-fastest time on Saturday, meaning he would have comfortably scored points had he not lost 26 minutes when he hit the bank on Friday. The 2007 F1 champion reflected: "It was a really encouraging event, which allowed me to learn so much. "From the start to the finish I felt I was improving all the time. Sure, we still have a lot to learn because the whole feeling is so different to what I had in Formula 1. "But I'm getting a good idea of how to use the pace notes now and I understand the car a bit better as well. "Now I'm looking forward to driving gravel on the next rally in Mexico; it should be a bit easier for me."